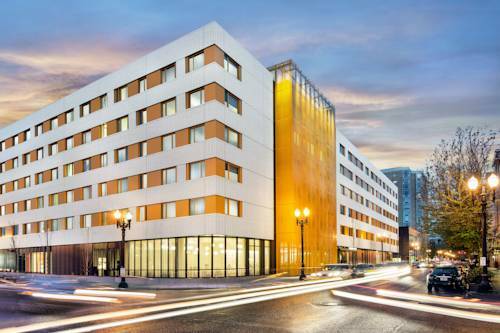 Settle into stylish accommodations at Residence Inn Portland Downtown/Pearl District, surrounded by the area's top downtown attractions. Enjoy convenience to the world-famous Portland Art Museum, boutique shops and celebrated restaurants near our Pearl District hotel. Portland International Raceway is also nearby, and Union Station is a six-minute walk away. After an exhilarating day of exploring, relax in spacious suites featuring sleek decor, free Wi-Fi, plush bedding and fully equipped kitchens. Start each morning at our complimentary breakfast buffet and on-site Starbucks, and indulge in locally inspired dinner dishes and expertly crafted cocktails at Lot 4 Urban Eatery, our popular restaurant. During downtime, take a refreshing dip in our indoor pool, or get your heart racing in our modern fitness center. Groups planning a downtown Portland gathering can choose from five event rooms for meetings and celebrations. Book a stay in the heart of Portland and make memories that will last a lifetime. Unique building shaped like an old fashioned moonshine jug with a spherical cork. Has survived numerous business incarnations and rebirths. A happy 1960s vintage outdoor statue display. Dad, Mom, Teen, and Baby Burger all hold aloft giant burgers and root beer mugs. Restored and given a place of honor by the town in 1993. Boring was the name of the man who founded the town, says a local librarian we encountered, as she weeded a ditch. Bobbie wanted to come home to Silverton so bad that he walked over 2,500 miles after his family lost him.